The latest Hearthstone expansion features a reference to The Undertaker and Mankind's infamous Hell in a Cell match – AiPT! Blizzard is known for cramming games such as World of Warcraft and Hearthstone to the brim with various pop culture references and memes. 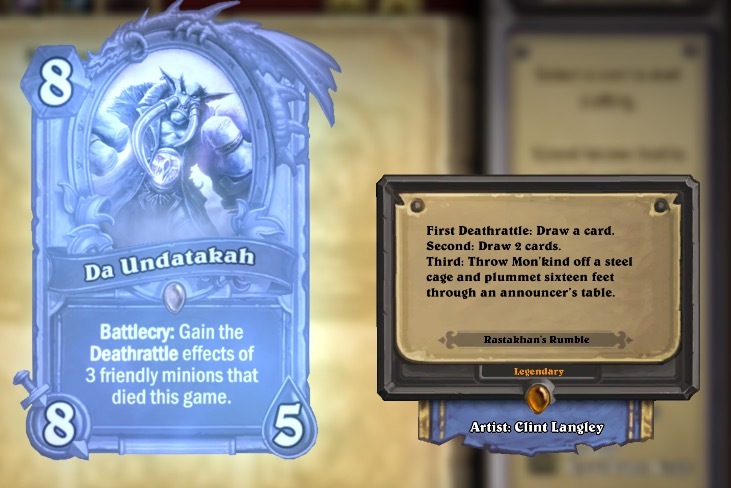 In the upcoming Hearthstone expansion, known as Rastakhan’s Rumble, a new card named “Da Undatakah” — which itself is a troll-ified callback to a card from a previous expansion, “The Undertaker,” gives a nod to one of the most infamous matchups in pro wrestling history. shittymorph has even made it to WWE’s radar, as the company sent him a package on the 20th anniversary of The Undertaker vs. Mankind at King of the Ring 1998.